"I am trying to put myself out of a job. It is my dream that one day cancer patients will no longer have to "go under the knife", but instead might be cured by unleashing their own immune system on cancer." As a head and neck cancer surgeon, I have seen first hand the success and failure of surgery in the treatment of patients. If caught early, people with head and neck cancer have an excellent prognosis. If diagnosed late, however, the majority will die, even when all three treatment modalities--surgery, radiation and chemotherapy--are utilized. I am trying to put myself out of a job. It is my dream that one day cancer patients will no longer have to "go under the knife", but instead might be cured by unleashing their own immune system on cancer. I continue to be awestruck by my courageous patients, who face this dreaded disease head on--- with verve, dignity, strength and a will to live that makes all other forms of human endeavor shrink to insignificance. It is their grace that inspires me to do better. The purpose of surgery for cancer is to remove the tumor in its entirety and leave no cancer cells behind in the patient. Surgeons carefully plan the operation to also remove a clear margin around the tumor. If cancer cells are found in the margin there is a strong risk they also have passed beyond the margin, and therefore are still in the patient. The risk of cancer returning due to cancer cells remaining in the patient is the problem we aim to solve. 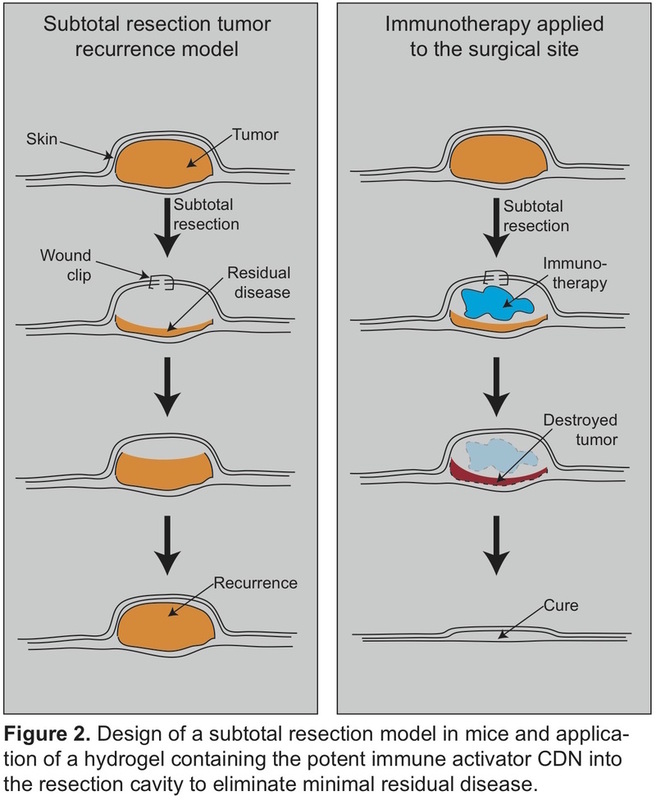 At the time of the operation, surgeons have the unique opportunity to deliver therapies directly at the tumor margin, which can target and destroy the few remaining cancer cells. Immunotherapy is based around helping our own immune system find, recognize, and destroy cancer cells. There is increasing excitement in oncology as we now have immunotherapies that can help patients destroy their own tumors. 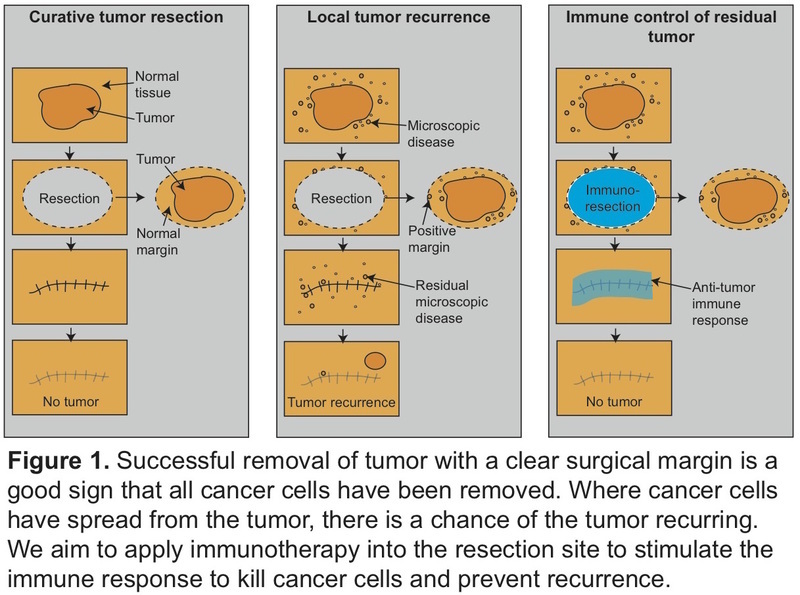 We propose a project to use immunotherapy to prevent tumor recurrence after surgical resection. Using preclinical models of cancer, we have previously shown that the immune system can kill the small number of cancer cells left after surgery, but it isn’t always successful. We also showed that if we boost the immune system, we can kill more cancer cells and clear the remaining cancer entirely. What we aim to do is develop a therapy that takes advantage of the unique access that surgeons have when removing tumors, and deliver immunotherapy directly to the surgical site following removal of the tumor to kill left over cancer cells. This project aims to test combinations of biomaterial and immunotherapy in a preclinical model of cancer recurrence following surgery. The project is designed to be scalable so more funding will allow us to test more immunotherapies and biomaterials until we can find the best combination for clinical translation. Our budget is designed to test 5 combinations at $10,200 per combination, to a total of $51,000. Each combination is broken down into Reagents: $2100, Preclinical model: $1900, Scientist salaries: $4700, Lab costs: $1500. Success in this project will have two consequences. Firstly, we will have a treatment with the potential to eliminate the risk of tumor returning following surgery. Secondly, if we have an approach that can clear cancer cells that are left in patients, it will make more people eligible for surgical removal of the tumor. If our therapy is sufficiently potent, perhaps those patients with tumors that cannot be removed in their entirety can have the majority of their tumors removed and rely on the immune system to clear the parts that could not be removed. Immunotherapy is not currently delivered as part of surgical removal of tumors. We feel this is a missed opportunity and we need to test this innovative approach as soon as possible because success could have great impact. Head and neck cancer typically arises in the oral cavity, oropharynx, larynx or hypopharynx, and is the 6th leading cause of cancer by incidence worldwide. Approximately 600,000 new cases are diagnosed each year, and only 40-50% of these patients will survive more than 5 years. Head and neck cancers are characterized by a high rate of regional tumor extension, cervical lymph node metastasis and frequent distant metastasis. Tobacco and alcohol and infection of human papilloma virus (HPV) are the major risk factors.